Hi everyone! 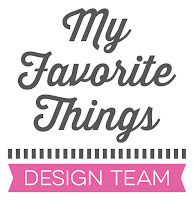 Today is the third day of the My Favorite Things December release countdown. This release is packed with amazing new products and it was so fun to play with all the new stuff! The new products will officially be available on the MFT online store on December 11th at 10:00 am EST (= Europe: December 11th at 4:00 pm CET). For the card base as well as for the front panel, I used Smooth White cardstock. I die cut the Beautiful word die twice from Smooth White cardstock too and adhered it with glue on top of each other, then to the card front. The orange patterned paper is from the Party Patterns paper pack. 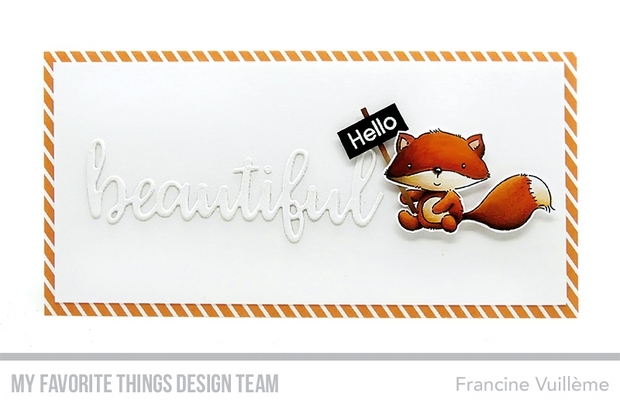 I heat embossed the Hello sentiment from the Fox & Friend stamp set onto Black Licorice cardstock using white embossing powder. I cut the fox with scissors but there are coordinating dies as well if you don’t like cutting with scissors. Such a sweet card, Francine! I love the white on white sentiment with your beautiful coloring and clever border...so cute! Such a sweet Thoughtful fox! OMG - you always color these animals so nicely. I love the shading! This card is adorable.